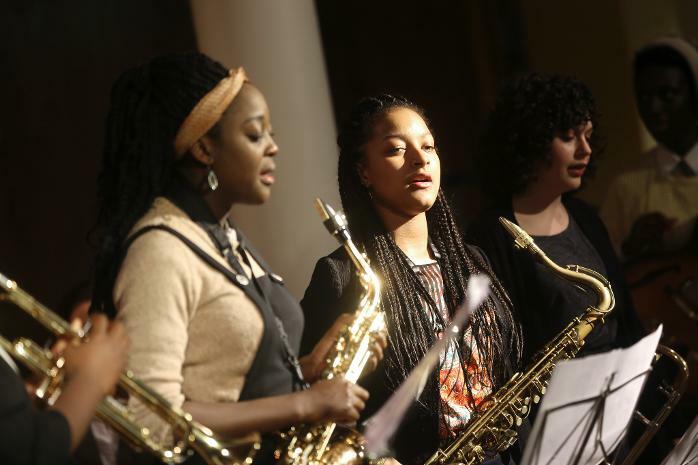 Come along and see some of the great jazz events and activities we have on offer as part of the 2014 Nucleo Weekend at Southbank Centre, London from Friday 6 June–Sunday 8 June, including a special workshop for young musicians who play stringed instruments! Artistic Director, Gary Crosby OBE introduces some of the most exciting new and emerging jazz artists rising through the ranks of his acclaimed Tomorrow’s Warriors Young Artist Development Programme – a programme that has spawned generation after generation of award-winning acts such as J-Life, Denys Baptiste, Soweto Kinch, Andrew McCormack, Empirical, Zara McFarlane, and many more! This special matinée concert features our flagship all-female ensemble, Nérija – who return to the Southbank Centre stage after making their international debut in Norway to mark International Women’s Day – and a brand new Tomorrow’s Warriors Development Group formed from some of the strongest players to attend our Young Artist Development Programme! Expect a variety of enthralling new material mixed with some of your favourite jazz standards. Tomorrow’s Warriors Youth Orchestra (TWYO) is the flagship ensemble of our Young Artist Development Programme. Their speciality is performing not only classic big band repertoire, but also hip new arrangements of their favourite contemporary tunes such as Amy Winehouse’s Valerie and D’Angelo’s Spanish Joint, plus new original works by our associated artists. Here under the direction of James McKay, they perform an eclectic set including work by Wayne Shorter, Nathan Theodoulou and Robert Spencer of the Cadillacs! Calling all musicians! Come and join Tomorrow’s Warriors for the Nucleo Big Busk! We are aiming to form a Nucleo Festival Jazz Supergroup! All musicians (whether involved in the Nucleo Weekend or not) are invited to join us for a massed group performance of the Duke Ellington classic ‘Take The ‘A’ Train’. Learn the melody, join in with the backing figures and if you’re feeling brave you can even take a solo. Tomorrow’s Warriors music leaders and musicians will be on hand to support you every step of the way. Artistic Director Gary Crosby OBE hosts a special jam session with help from our Music Leaders to round off a day full of fantastic musical activity. Musicians of all ages are welcome to come and join in, and audience members can expect to see younger players cutting their teeth against seasoned pros in good spirit and in a very supportive environment, staying true to the Tomorrow’s Warriors ethos. This will be a classic Tomorrow’s Warriors jam session so expect musical fireworks and maybe even the odd special guest! Formed in late-2013, this is Tomorrow’s Warriors’ newest band. It features five young female musicians, who came together as friends through the Tomorrow’s Warriors programme and who all share a passion for jazz. They made their debut performance in March as part of Music for Youth’s Regional Festival, and so impressed the judges that they have been invited to the MFY National Festival to be held in Birmingham in July. Here come the girls! Aged from 15-19 and mentored by our apprentice Music Leader and Emerging Artist, Sheila Maurice-Grey, expect some fresh new arrangements as well as some classic jazz tunes. Tomorrow’s Warriors Junior Band have gone from strength to strength since performing on this same stage last year. This wonderful quintet – with musicians aged 13-16 years – performed at a number of summer festivals last year and have recently been offered a place at the Music For Youth National Festival in Birmingham! Expect some of the best young jazz musicians in London to show what they can do – including some of the band members’ own arrangements, specially commissioned by Tomorrow’s Warriors for their Silver Arts Award projects. An exciting opportunity for young string players who have an interest in jazz. Come along and discover some of the wealth of possibilities this wonderful music offers to string players with music leader, Max De Lucia. Open to all string players aged 18 or under. Recommended level of Grade 3 and above to get the most from the session. Come early as space is limited, and BRING YOUR INSTRUMENT (we will have one double bass available). A taster workshop open to all instrumentalists aged 11-18 who would like to try playing jazz. Led by Tomorrow’s Warriors music leader Ben Burrell, this session is designed to give a taste of how jazz works and how much fun can be had playing it. Recommended level Grade 3+, though you don’t need to have actually taken any formal music exams. Come early as space is limited, and BRING YOUR INSTRUMENT (we have a piano, drum kit and one double bass available)! Several musicians from our Tomorrow’s Warriors Emerging Artist programme join Big Phat Brass on stage to perform a collaborative piece developed especially for this year’s Nucleo. Sounds terrific! I’ve never been disappointed in a performance by Tomorrow’s Warriors, their spin-offs or of course groups such as Empirical that have emerged from them. Great work, Gary. Jazz buff for 50+ years. Lovely of you to say so, Keith! We’re all looking forward to a fantastic weekend. See you there!